Got mad Tableau chops? 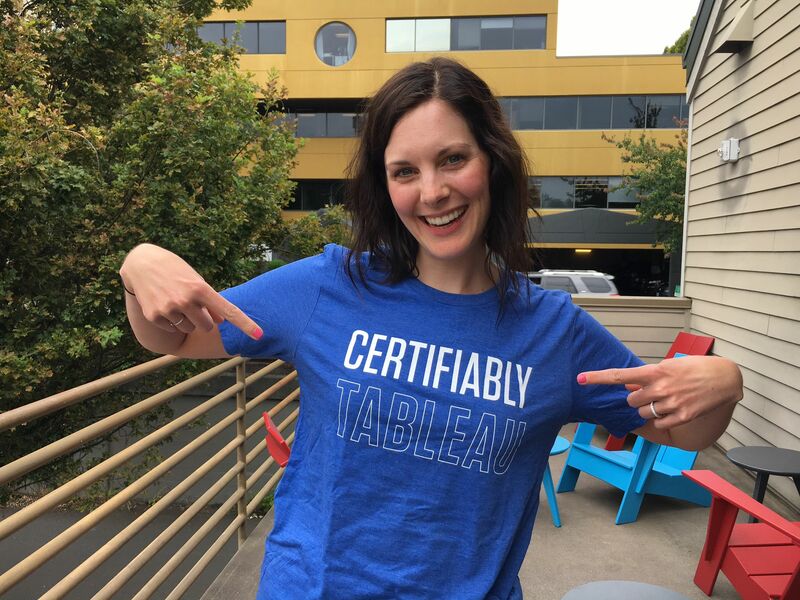 Differentiate yourself by becoming Tableau-certified. We offer two different certifications to help you showcase your skills. First prove your technical prowess with the Qualified Associate exam, then get tested on best practices with the Certified Professional Exam. Whichever level you choose, a Tableau certification just might be that professional boost you’re looking for. We often hear from people who tell us their certification opened doors to new opportunities. “That stamp of approval goes a long way toward building interest and trust with potential clients. It has also led to a number of unsolicited full-time employment offers,” says David. Michael, who manages the Center of Excellence at his organization, says his certification earned him the trust of internal leaders. “When I tell my leadership that we need to scale up/out, reconfigure, and introduce various training to engage and ready our users, I have a piece of paper that I can pull out and let them know I know what I'm talking about,” he says. For Emma, the certification provided an internal boost. “It’s given me the confidence to completely change my career path,” she says. Whatever your goal, preparing for the exams also helps you become your best analyst self, says Timothy. “Look at it the fun way: It's a challenge. CAN you get certified? ARE you up to the challenge that is getting the second certification?” he says. Visit our certification page to learn more about the exams and how you can best prepare for each level. We offer both exams online so you can take them anytime, anywhere. You can also take them in person at TC16 and select Tableau Conference on Tours. Once you pass your exams, you’ll receive official LinkedIn and Tableau Community badges, exclusive swag, and, of course, your certification. You’ll also gain access to a community of like-minded certified professionals. Man - I really want to do this but the cost is just too high for me. I see that you offer training, but is there a free virtual learning track to take that I could just do on my own - instead of having to pay $1,200 for the course to bring me up to speed? Right now as a it stands if I want to get professionally certified it would cost me just too much as a recent grad working at a smaller company. All the tracks offer a study-guide that directs you to the FREE on-demand training. Included and available are the the live training sessions. Read up on blogs, too. The training and examples offered by Tableau Public are also great. 1. Start with http://www.tableau.com/certification and download both the qualification and certification guides for Desktop. Even if you plan only on doing qualification, the certification roadmap/planning guide is a huge help. Feel free to join the Phoenix Tableau User Group at www.phxtug.com and linkedin.phxtug.com if you'd like. Love to have you even if you're not local. Tableau is the future. I'm certifiable. Shoot us an email at certification@tableau.com with what exam you are wanting to take and we can discuss options with you. Hi , I took the certification in March but never received any official LinkedIn and Tableau Community badge or exclusive swag. also I did not gain access to a community of like-minded certified professionals. Hey Sapna, Shoot us an email at certification@tableau.com and we're happy to discuss benefits with you!